KIEV, Ukraine -- It has long been known that Moscow is determined to prevent Ukraine from entering into an Association Agreement with the European Union. Ukrainian politician Viktor Medvedchuk (R) and Russian President Vladimir Putin in Kiev on July 27. And now, it seems, the Kremlin has a plan. At least that's what many in Ukraine are thinking after the newspaper "Dzerkalo tyzhnia" over the weekend published a 10-page document the paper claims was drafted by Moscow and its allies in Ukraine that outlines a multipronged effort to extend Russia's influence in the country. Opinions vary on the authenticity of the document. But former Foreign Minister Volodymyr Ohryzko told RFE/RL's Ukrainian Service he had no doubt it reflects Moscow's intentions. "You probably noted such words as 'coercion,' 'forcing,' and so on [in the document]. This has been the core of Russia's policy toward Ukraine for a long time," Ohryzko said. "This is nothing new -- it is the continuation of the same imperialistic course. "I hope this document will be read by as many Western diplomats in Ukraine as possible and that they will pass on the details to their capitals. Maybe it will help them reach the right conclusions and finally realize that there is a systematic ideological, political, economic, and information war being waged against Ukraine." The paper lays out a plan for achieving three key goals: preventing Ukraine from signing an EU Association Agreement, creating an "influential network" of pro-Russian organizations capable of preventing the government from "undertaking actions that are not beneficial for Russia," and bringing Ukraine into the Russia-led Eurasian Customs Union and Single Economic Space by 2015. The publication comes at a time of high tensions between the two countries. Russia recently conducted intense inspections of all goods crossing the border, saying it was rehearsing measures that would be implemented if Kiev proceeds with the "suicidal" agreement with the EU (Kiev announced on August 20 the checks had stopped). Moscow has also specifically targeted the Roshen candy factory, which is owned by pro-Western former Foreign Minister Petro Poroshenko. The purported document states plainly that Ukrainian politician Viktor Medvedchuk and his Ukraine's Choice civic movement can play "a key role" in achieving its goals. RFE/RL asked Medvedchuk directly whether he was involved in drafting the paper. He responded with a written statement criticizing the "yellow press" for publishing unverified documents. "This is not the first time the yellow press has tried to connect my name with various scandalous stories. And publishing their fantasies under the guise of 'secret documents' citing unclear sources is a device that charlatans in the mass media have resorted to for centuries," Medvedchuk's statement said. Although Medvedchuk's statement said nothing specifically about the published document or his alleged role in creating it, it did affirm his support for Ukraine's membership in the Russian-led customs union and asserted that his activity and the activity of Ukraine's Choice is "completely open." The controversy casts a spotlight on the position of Ukrainian President Viktor Yanukovych, who was widely viewed as a pro-Russian figure when he took office in 2010 on promises of improving relations with Moscow. However, Yanukovych has since publicly followed a pro-European line, and Ukraine has been one of the success stories of the EU's Eastern Partnership Program. Kiev has already initialed an Association Agreement and a Deep and Comprehensive Free Trade Agreement (DCFTA) with Brussels and those documents could be finalized at the Eastern Partnership summit in Vilnius in November. Kiev's relations with Brussels, however, have been complicated by the jailing of former Prime Minister Yulia Tymoshenko in a case widely seen as politically motivated. Yanukovych has pursued his pro-European policy by relying on a carefully balanced political power base comprising the pro-Russian business interests that helped bring him to power, the pro-Western business interests that have been attracted by his Europe-oriented policies, and a growing cadre of bureaucrats and top managers who have been installed since he took office and who owe their positions to him. The purported Russian document has led some analysts to conclude that Moscow is looking beyond November, toward the Ukrainian presidential election in 2015 and parliamentary elections in 2017. But can Medvedchuk, 59, accomplish the plan's goals? He served as chief of staff under Ukrainian President Leonid Kuchma and has been accused of using state resources to promote Yanukovych's unsuccessful 2004 presidential bid. He denies those allegations and in recent months his Ukraine's Choice movement has been highly critical of Yanukovych. Medvedchuk's pro-Russian credentials are easier to establish. Putin and the wife of Russian Prime Minister Dmitry Medvedev are the godparents of Medvedchuk's daughter. During Putin's recent visit to Ukraine to mark the 1,025th anniversary of the baptism of Kievan Rus, Putin spent far more time with Medvedchuk than with Yanukovych. 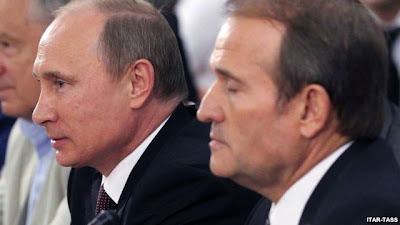 And last week, Medvedchuk was photographed attending a sports event in Sochi together with Putin, Medvedev, and Kazakh President Nursultan Nazarbaev. He has played influential behind-the-scenes roles in Ukraine for years, but he has little public support. Although Putin personally has high popularity ratings in eastern Ukraine, his endorsement is unlikely to boost Medvedchuk, says Kiev-based analyst Kost Bondarenko. "Even if Putin appeared with Medvedchuk in eastern Ukraine tomorrow and called on people to vote for him -- Putin's own rating in those regions is about 25 percent -- it would not mean that Mevedchuk's popularity would rise," Bondarenko says. "He'd get maybe 3 or 4 percent. Russia can play as much as it wants, but its games have little effect in Ukraine, as previous election campaigns have shown." Political analyst Taras Berezovets agrees that even with the considerable financial backing of the Kremlin, Medvedchuk would not be able to compete with Yanukovych. At best, Berezovets says, Medvedchuk might play the spoiler, weakening Yanukovych by draining off pro-Russian votes. "The statements in support of Viktor Medvedchuk that Putin has already been making can help boost his rating to a certain extent," Berezovets says. "But paradoxically, the historical mission of Medvedchuk might be to prevent Viktor Yanukovych from being elected to a second term."